The franc (sign: Fr. or SFr. ; German: Franken, French and Romansh: franc, Italian: franco; code: CHF) is the currency and legal tender of Switzerland and Liechtenstein; it is also legal tender in the Italian exclave Campione d'Italia. Although not formally legal tender in the German exclave Busingen (the sole legal currency is the euro), it is in wide daily use there. The Swiss National Bank issues banknotes and the federal mint Swissmint issues coins. In 1907, the Swiss National Bank took over the issuance of banknotes from the cantons and various banks. It introduced denominations of 50, 100, 500 and 1000 Swiss francs. 20 franc notes were introduced in 1911, followed by 5 franc notes in 1913. In 1914, the Federal Treasury issued paper money in denominations of 5, 10 and 20 francs. These notes were issued in three different versions: French, German and Italian. The State Loan Bank also issued 25 franc notes that year. In 1952, the Swiss National Bank ceased issuing 5 franc notes but introduced 10 franc notes in 1955. In 1996, 200 franc notes were introduced whilst the 500 franc note was discontinued. Eight series of Swiss franc banknotes have been printed by the National Bank, six of which have been released for use by the general public. The sixth series from 1976, designed by Ernst and Ursula Hiestand, depicted persons from the world of science. It has been recalled and replaced and will lose any value on 1 May 2020. As of 2010, a large number of notes from this series have not yet been exchanged, even though they have not been legal tender for more than 10 years; for example, the value of those 500 franc banknotes still in circulation represents 129.9 million Swiss francs. The seventh series was printed in 1984, but kept as a "reserve series", ready to be used if, for example, wide counterfeiting of the current series suddenly happened. When the Swiss National Bank decided to develop new security features and to abandon the concept of a reserve series, the details of the seventh series were released and the printed notes were destroyed. The current, eighth series of Swiss franc notes was designed by Jorg Zintzmeyer around the theme of the arts and released starting in 1995. In addition to a new design, this series was different from the previous one on several counts. Probably the most important difference from a practical point of view was that the seldom-used 500 franc note was replaced by a new 200 franc note; this new note has indeed proved more successful than the old 500 franc note. The base colours of the new notes were kept similar to the old ones, except that the 20 franc note was changed from blue to red to prevent a frequent confusion with the 100 franc note, and that the 10 franc note was changed from red to yellow. The size of the notes was changed as well, with all notes from the 8th series having the same height (74 mm), while the widths were changed as well, still increasing with the value of the notes. The new series contains many more security features than the previous one; many (but not all) of them are now visibly displayed and have been widely advertised, in contrast with the previous series for which most of the features were kept secret. All banknotes are quadrilingual, displaying all information in the four national languages. The banknotes depicting a Germanophone person have German and Romansch on the same side as the picture, whereas banknotes depicting a Francophone or an Italophone person have French and Italian on the same side as the picture. The reverse has the other two languages. 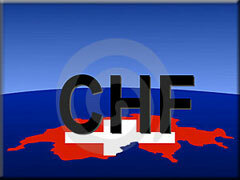 When the 5th series lost its validity at the end of April 2000, the banknotes that had not been exchanged represented a total value of 244.3 million Swiss francs; in accordance with Swiss law, this amount was transferred to the Swiss Fund for Emergency Losses in the case of non-insurable natural disasters. In February 2005, a competition was announced for the design of the 9th series, planned to be released around 2010 on the theme Switzerland open to the world. The results were announced in November 2005, but the selected design drew widespread criticisms from the population. As a result, the release date has been repeatedly postponed. In December 2015, it was announced that the new series would start being issued on 12 April 2016. The first denomination to be released will be the 50-franc note, others will follow in half-yearly or yearly intervals. The issuing of the entire new series is scheduled to be completed by 2019. As of 2014 statistics, the total value of released Swiss banknotes was 62,696.9 million Swiss francs. The Swiss franc is the sixth most traded currency in the world.